Today, I introduced my homestead school property tax elimination legislation that proposes elimination of school property taxes on owner-occupied homes. The bill number is Senate Bill 1137. Additional changes to the language were needed this week as discussions were finalized with the Appropriations Committee and legal counsel. I will host a press conference this Monday, April 23 in the State Capitol building where I will discuss the specific details of the proposal. Following the press conference, we will send out an official summary with the details of the bill. In addition, I will be discussing my school property tax elimination bill on the Monday evening LIVE PCN Call-In Program with Senator Lisa Boscola. The program begins at 7 p.m.. I encourage you to call in with your questions at 877-726-5001. The Senate approved a measure on Wednesday that provides a comprehensive rewrite of the state’s hazing laws. Senate Bill 1090 requires schools to have policies and reporting procedures in place to stop hazing and inform students and parents of what is happening on campus. It also establishes clear-cut parameters on hazing for organizations such as fraternities and sororities. The bill is named after Timothy Piazza, a sophomore engineering student at Penn State University who died on Feb. 4, 2017, as a result of hazing at a fraternity. Repeat DUI offenders would face tougher penalties under legislation approved by the Senate on Wednesday. Senate Bill 961 increases the penalties for a person who unintentionally causes the death of another person as a result of a second or subsequent DUI violation. The bill increases the grading of subsequent DUI crimes and levies harsher sentences against repeat offenders who cause the death of another person. There were 10,256 alcohol-related crashes and 297 alcohol-related fatalities in Pennsylvania in 2016. Senate Bill 961 increases the minimum term of imprisonment for a person who unintentionally causes the death of another person while intoxicated from three years to five years if the person has a prior DUI, and from three years to seven years if the offender has two or more prior DUIs. The measure also increases sentencing provisions for offenders who are not properly licensed or under suspension. Senate Bill 961 now goes to the House of Representatives for consideration. Local school districts and governments would be permitted to discuss school security matters in executive sessions, which are closed to the public, under a measure unanimously passed by the Senate on Tuesday. If made public, this information could compromise school safety efforts and put students at risk. More than half of the states currently have measures in place which allow for security and safety matters to be discussed in non-public executive session. Senate Resolution 260 extends the term of the Senate Resolution 6 Commission on fire and EMS issues from June 30 to November 30, 2018. Senate Resolution 278 establishes a temporary rule of the Senate regarding amendments to appropriations bills for the 2018-19 budget. Senate Bill 653 further consolidates the collection of local, non-real estate taxes, at the county level. Senate Bill 742 provides for a comprehensive bill of rights for sexual assault victims. House Bill 866amends the Local Tax Enabling Act to clarify certain provisions related to the consolidated collection of local income taxes and delinquent taxes. I voted against this bill. Senate Bill 880 allows trailers up to 102-inch wide on highways. Legislation that would save costs and address opioid abuse under Pennsylvania’s Workers’ Compensation program received final legislative approval this week and was sent to the Governor for enactment into law. Senate Bill 936, which was approved by the House of Representatives on Monday and by a strong bi-partisan vote in the Senate on October 25, 2017, would require the Pennsylvania Department of Labor & Industry to adopt an evidence-based drug formulary for Pennsylvania’s Workers’ Compensation program. In addition to lowering costs and providing better care for patients, the proposal is intended to assist the Commonwealth in its battle against opioid addiction. The adoption of a drug formulary, which is commonplace in health insurance, would reduce the over-prescription of opioid painkillers by setting evidence-based standards for the medication that can be prescribed for a Workers’ Comp patient. The legislation would also eliminate payments for overpriced, unproven pain creams. The legislation also addresses ethical problems illustrated in a Philadelphia newspaper article. Some law firms that specialize in Workers’ Compensation have their own pharmacies. This allows them to refer clients to doctors with which they have referral agreements and, in turn, the doctors write prescriptions and send them to the pharmacy the firm owns. The Senate concurred Wednesday on House amendments to a bill that expands the legal standing for grandparents and other third-party individuals seeking to gain custody in cases where no biological or adoptive parent has care and control of the child. Senate Bill 844 now goes to the Governor for enactment into law. The bill addresses the devastating toll of the opioid crisis on families across the Commonwealth, which can be especially heart-wrenching when it involves the innocent children of addicts who — because of their addiction — are unable to care for them. Often, third-parties, especially grandparents, are called upon to care for those children, even though they currently have little to no legal standing under current state law. The bill received unanimous support in both the Senate and House of Representatives and was endorsed by organizations including the Pennsylvania Bar Association, the Center for Child Advocates and Pennsylvania Legal Services. When the legislature amended Pennsylvania’s custody and visitation law in 2010, a grandparent’s right or “standing” to file for custody of a grandchild became more limited, essentially removing what was once an automatic right. “Standing,” in a legal sense, is a preliminary step that determines only which parties can be in the courtroom pursuing custody. In a custody trial the court considers the “best interests of the children” and takes into account the children’s relationship with all of the parties. The bill also includes a provision under which grandparents and great-grandparents may file an action for partial physical custody or supervised physical custody in cases where the parents of the child have commenced a proceeding for custody and do not agree whether grandparents should have custody. House Bill 595, which provides for the types of complaints that can be filed with the Bureau of Consumer Protection regarding planned communities, cooperatives and condominiums. 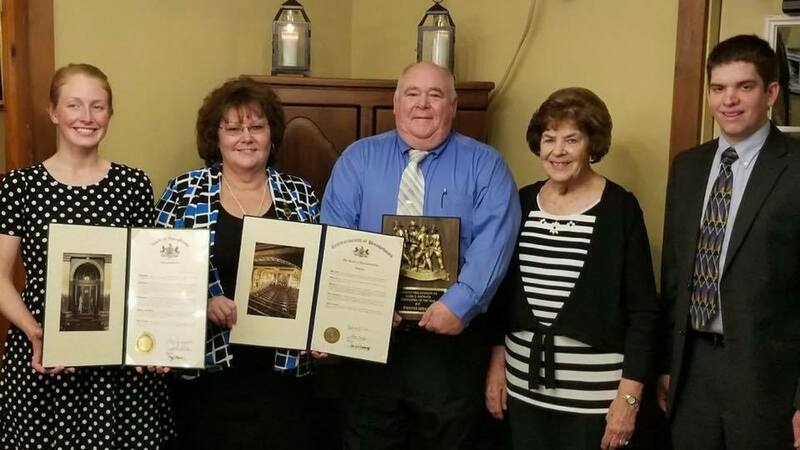 Senate Bill 837, which renames part of a Westmoreland County road as the Specialist 4 William J. Kolenc Memorial Highway. Senate Bill 877, which amends the Insurance Department Act to allow producers and insurers to spend as much as $100 in marketing insurance to a client or prospective client. Senate Bill 878, which amends the Insurance Company Law to allow producers and insurers to spend as much as $100 in marketing insurance to a client or prospective client. House Bill 1341, which amends the Bituminous Coal Mine Safety Act to allow emergency medical responders to be employed at mines. The Senate Appropriations Committee approved 11 bills on Monday. Senate Bill 435 requires all motorists to clear snow and ice from the top of their vehicles before driving. House Bill 866 amends the Local Tax Enabling Act to clarify certain provisions related to the consolidated collection of local income taxes and delinquent taxes. Senate Bill 1041 directs the Department of Military & Veterans Affairs to create logos to promote veteran-owned and disabled veteran-owned businesses. Senate Bill 1090 increases penalties for hazing and requires schools to have policies and reporting procedures in place to stop hazing. The Senate Education Committee held a public hearing Wednesday on potential alternatives to the Act 88 collective bargaining process and teacher strikes. The Senate Finance Committee approved Senate Bill 1056 on Tuesday. The bill allows long-standing deductions for depreciation in determining taxable income. The Senate Judiciary Committee approved three bills on Tuesday. Senate Bill 189 amends Pennsylvania’s Crime Victims Act to allow victims to attend the entirety of criminal trials. Senate Bill 1092 amends the Crimes Code to create an offense for domestic violence in front of children. Senate Bill 1132 establishes an Alternative Dispute Resolution Commission. The Senate State Government Committee approved three bills on Tuesday. Senate Bill 299 changes the way that an incumbent magisterial district judge gets on the ballot for re-election. Senate Bill 1038 amends the Pennsylvania Election Code regarding residual funds. The Senate Urban Affairs and Housing Committee approved two bills on Wednesday. Senate Bill 962 strengthens blighted property code violations when the owner has received state funds. The Senate Veterans Affairs and Emergency Preparedness Committee approved Senate Bill 1073 on Tuesday. The legislation would extend the Pennsylvania Heart and Lung Act to include several law enforcement entities that are not currently protected by this important coverage. Congratulations to Adam Mazarul, the newest Eagle Scout of Troop 76 of Lower Nazareth. For his Eagle project, Adam oversaw and performed a variety of updates for the Northeast Ministry Food Bank. Volunteers moved the location of canned and boxed goods; fixed and painted damaged walls; installed metal shelving units; and replaced light switch covers and light bulbs. He also constructed a wooden mobile island to help distribute the food and provide additional storage. Thank you for your committed service to our community, Adam, and I wish you all the best as you continue to uphold the ideals of Scouting. Dennis Miller received the James G. Dietrich Firefighter of the Year Award from Lookout Fire Company No. 1 in Pen Argyl. It was our privilege to recognize your unwavering dedication to our community and commend you on this well-deserved honor. 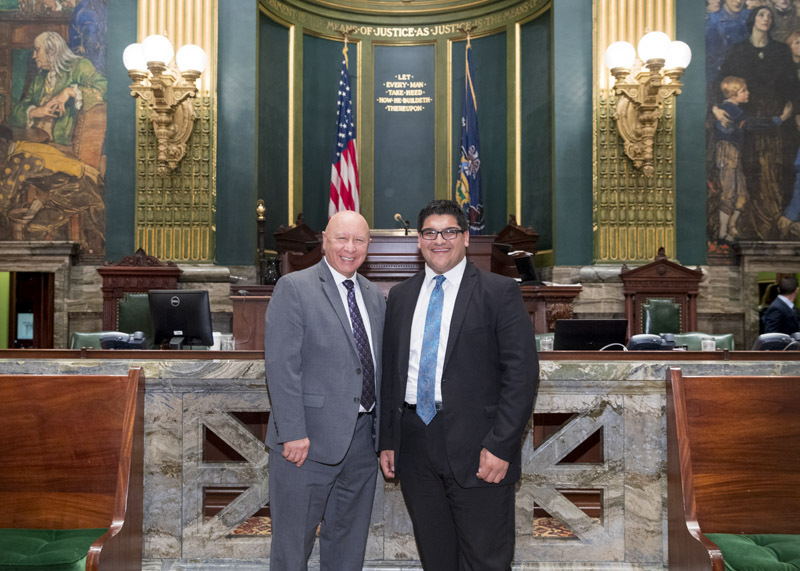 It was a pleasure to host Jake Sarwar in Harrisburg this week as my guest shadow for the day. Jake is a sophomore at Kings College in Wilkes Barre and has a bright future in politics. On campus, Jake is a Resident Assistant, Campus Activities Leader, and a member of the Knights of Columbus. As a HOPE Peer Educator, Jake is actively involved in supporting the needs of fellow students. As the name indicates, he helps provide hope and support for students struggling with a number of issues – from stress and anxiety to those with thoughts of depression – and helps plug those students into events and activities where they receive the encouragement they need. This year, while only a sophomore, Jake was elected as Student Body President for Kings College and is helping lead new and exciting initiatives on campus. Congratulations on your many accomplishments both inside and outside the classroom, Jake. I know you will continue to succeed in all that you do. 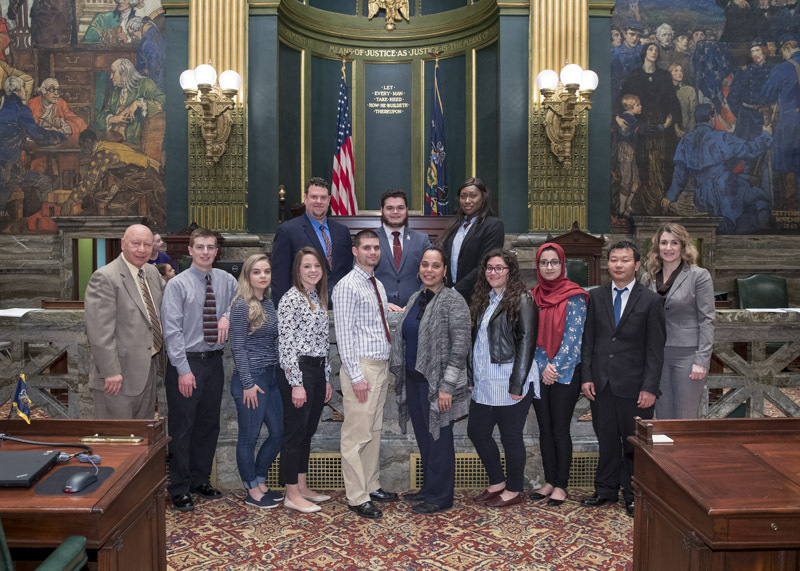 Students from East Stroudsburg University visited the Capitol this week for Student Aid Advocacy Day and we discussed the importance of preserving support for our students attending state-owned universities. These outstanding students have bright futures and it is important that we ensure the highest quality education continues. The Senate returns to voting session Monday at 1 p.m. You can watch session live at PASenateGOP.com.